A combination of bad weather and a technical glitch have pushed a brand-new supply ship's debut test flight to the International Space Station back at least one day, to Wednesday (Sept. 18). 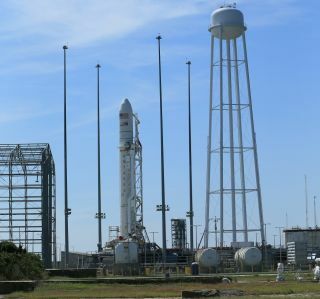 The unmanned Cygnus spacecraft, built by Virginia-based company Orbital Sciences, is now scheduled to blast off atop an Antares rocket from Wallops Island, Va., on Wednesday (Sept. 18) rather than Tuesday. Liftoff is set for 10:50 a.m. EDT (1450 GMT). "After comprehensive inspection and testing this morning, the problem was found and turned out to be an inoperative cable, which is being replaced," they added. "Orbital will repeat the combined systems test later today. Once that important test is successfully completed, the team will be able to proceed toward a September 18 launch." The cylindrical Cygnus spacecraft and its Antares rocket are designed to launch cargo delivery missions to the space station for NASA. Orbital Sciences has a $1.9 billion deal with NASA for eight Cygnus delivery missions, but these flights can begin only after the company proves the spacecraft is ready to haul supplies to the orbiting lab. Orbital Sciences launched the first Antares rocket test flight in April. But that demonstration carried only a mass simulator designed to mimic the weight of a Cygnus spacecraft on the rocket. Wednesday's planned launch will lift off from Pad 0A at the Mid-Atlantic Regional Spaceport at NASA's Wallops Flight Facility. The mission will mark the debut of a fully functional Cygnus cargo ship, Orbital Sciences officials said. If all goes well, the Cygnus supply ship will arrive at the International Space Station on Sept. 22 after a series of in-orbit tests, NASA officials said. "This mission will mark the completion of a five-year journey that NASA and our company embarked on in 2008 to create a new medium-class rocket, a sophisticated logistics spacecraft and a world-class launch site at the Wallops Flight Facility," Orbital Sciences CEO David Thompson said in a statement Friday (Sept. 13), the day Cygnus and Antares rolled out to the launch pad. Orbital Sciences is one of two commercial spaceflight companies with billion-dollar contracts to provide cargo delivery missions to the International Space Station for NASA. The other company, the Hawthorne, Calif.-based SpaceX founded by billionaire Elon Musk, has a $1.6 billion deal for at least 12 cargo missions using its unmanned Dragon space capsules and Falcon 9 rockets. SpaceX has flown two of those 12 missions so far. Unlike SpaceX's Dragon space capsules, which can return experiment hardware and equipment to Earth, Orbital Sciences' Cygnus vehicles are disposable and burn up in Earth's atmosphere at the end of each mission. Cygnus vehicles are cylindrical bus-size spacecraft designed to carry up to 5,952 pounds (2,700 kilograms) in their enhanced configuration. The first Cygnus spacecraft launch Wednesday will carry about 1,300 pounds (589 kg) to the Expedition 37 crew aboard the space station. When Cygnus arrives at the station, astronauts aboard the orbiting lab will use a robotic arm to capture the spacecraft — a method also used for SpaceX's Dragon capsules and Japan's robotic cargo-carrying H-2 Transfer Vehicles.